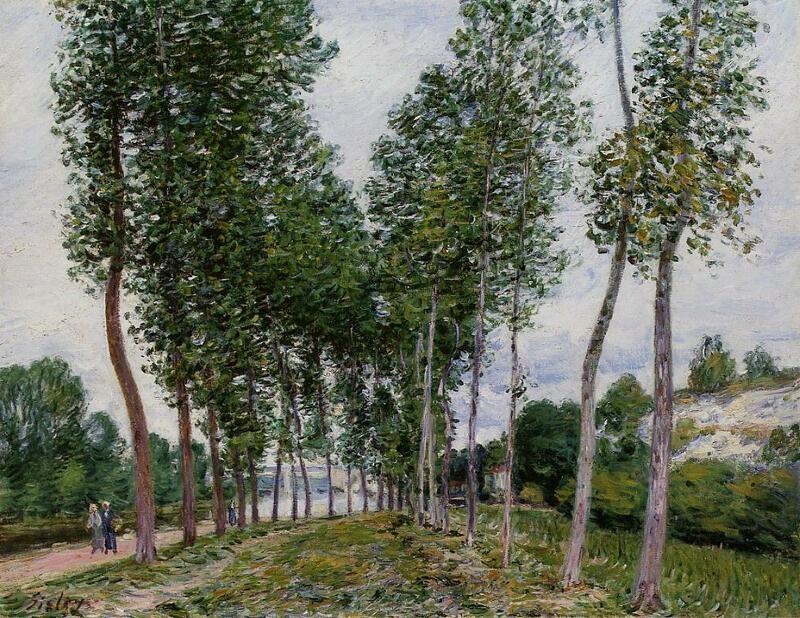 Alfred Sisley (1839–1899), The Lane of Poplars at Moret-sur-Loing (1890), oil on canvas, 62 x 81 cm, Musée d'Orsay, Paris. EHN & DIJ Oakley. Alfred Sisley was the only core member of the French Impressionists who remained a dedicated landscape painter throughout his career, and who painted few works which were not completed plein air. Although many of his motifs were views of rivers, a high proportion of his 900 or so oil paintings feature trees in a substantial way. He, and his work, are sadly neglected today, although I argue here that his best works are on a par with the finest by Monet and Pissarro. Critics seem keen to point out that his quality is perhaps less consistent than that of the other Impressionists, but without a modern catalogue raisonné it is very difficult to gain an accurate overview. Others claim that at times his paintings appear imitative of Pissarro in particular, but as I hope you will see, this too is quite unjust. 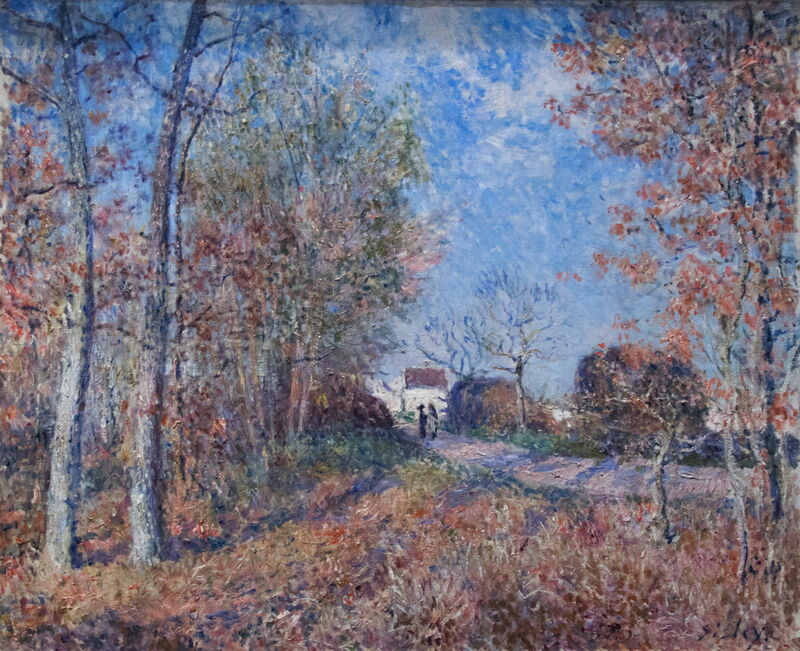 I have already covered Sisley in the Favourite Paintings series, and examined his series paintings. Alfred Sisley (1839–1899) was born and brought up in a prosperous Anglo-French family who were merchants in Paris. Although destined to take over the family business, when he was sent to London to study in 1857, he apparently was so moved by the paintings of JMW Turner and John Constable that he resolved to be an artist. When he returned to Paris in 1860-1, he started classes in Gleyre’s studio, where he became friends with those later to form the core of French Impressionism: Monet, Renoir, and Bazille. 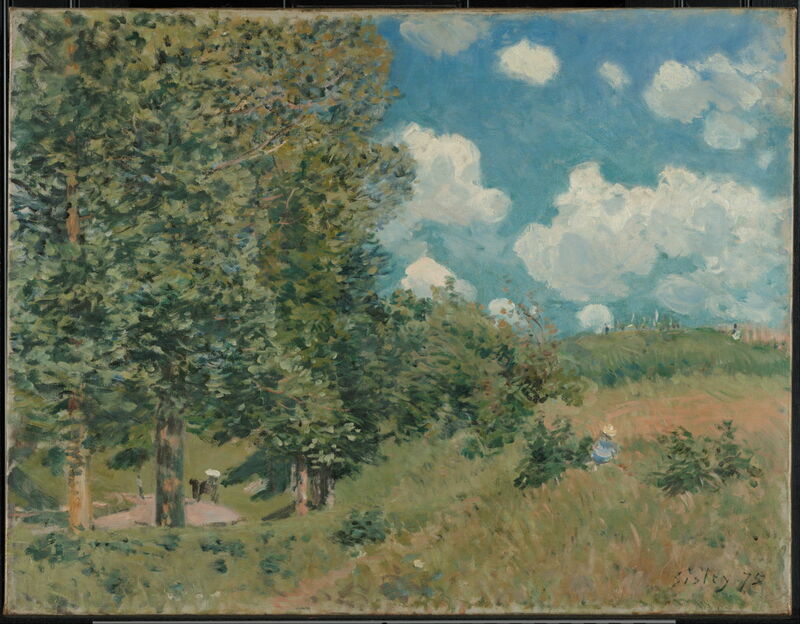 Although often omitted from accounts of the development of Impressionism, Sisley painted plein air alongside those Impressionists, and like them showed early influence by the work of Corot and the Barbizon school. Two of his paintings were accepted by the Salon in 1866, but he had no further official recognition. He started living with Eugénie Lesouezec in 1866, and together they raised their family in financial comfort until the outbreak of the Franco-Prussian War in 1870. Like Pissarro, their home was overrun and many of his paintings destroyed. Worse still, the family business collapsed, and for the rest of his life Sisley and his family lived in abject poverty. His paintings sold little, and he was reliant on patrons including Gustave Caillebotte, Jean-Baptiste Faure (singer and actor), and a successful pastry chef. Monet was a staunch friend, and Sisley showed paintings in four of the Impressionist exhibitions between the first in 1874 and the seventh in 1882. 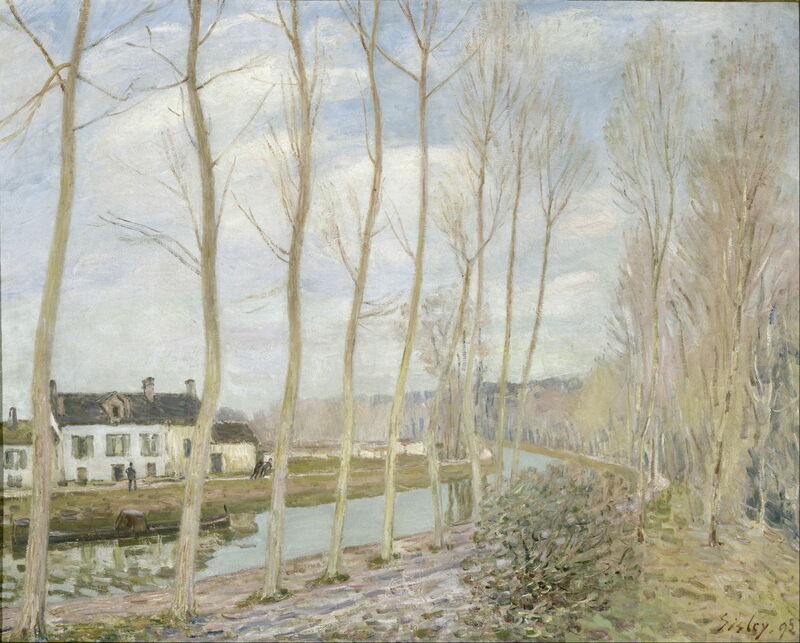 Sisley’s patron Faure took him to London in 1874, where he painted, and on his return to France he and his family moved to Marly-le-Roi, where some of his best-known works were made. They moved to Sèvres in 1877, before settling permanently in Moret-sur-Loing in 1880, to the south-east of Paris and near the Forest of Fontainebleau. The great majority of his works from 1880 were painted close to that town. In 1897, he and his wife visited the UK again, where they were finally married, and legitimised their children. Some of his best paintings were made during that period in South Wales. However his wife became unwell and died of cancer late the following year, and a few months later, in early 1899, Sisley himself died. Fellow Impressionists raised an auction to support his surviving children, as Sisley died almost penniless. Alfred Sisley (1839–1899), A Lane near a Small Town (c 1864), oil on canvas, 45 x 59.5 cm, Kunsthalle Bremen, Bremen. Wikimedia Commons. 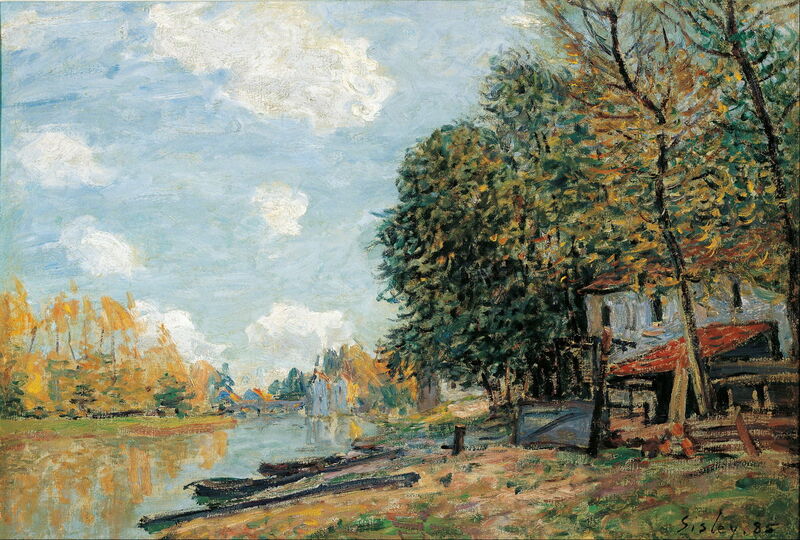 This is probably the earliest painting remaining from the start of Sisley’s career. 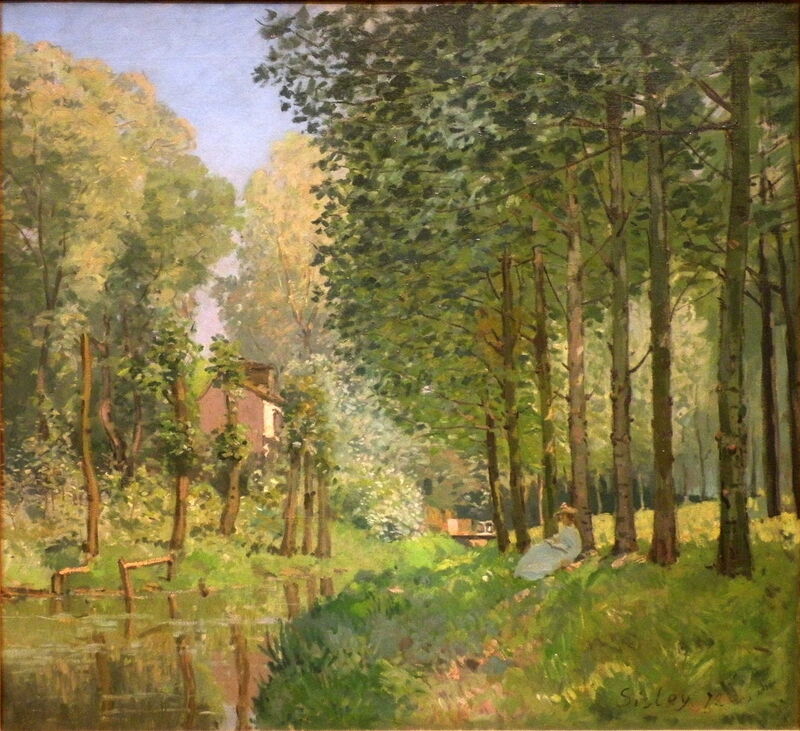 Although significantly lighter than other works which remained under the influence of the Barbizon school, its trees are constructed anatomically and have canopies which are painted in a manner very similar to the contemporary works of Corot, a major influence on Sisley’s early style. Alfred Sisley (1839–1899), The Road from Versailles to Saint-Germain (1875), oil on canvas, 51.1 x 65.1 cm, Getty Center, Los Angeles, CA. Wikimedia Commons. 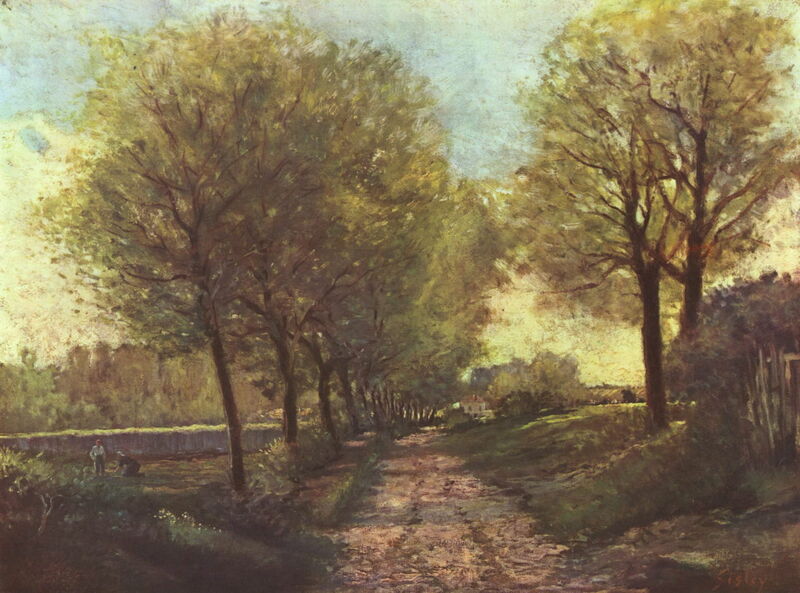 Sisley’s paintings of trees in the 1870s show the beginning of a style of his own. There is still some anatomical structure, but the canopies are now exuberant and more substantial. The range of greens used for foliage is quite limited, although they cover a wide range of tones. 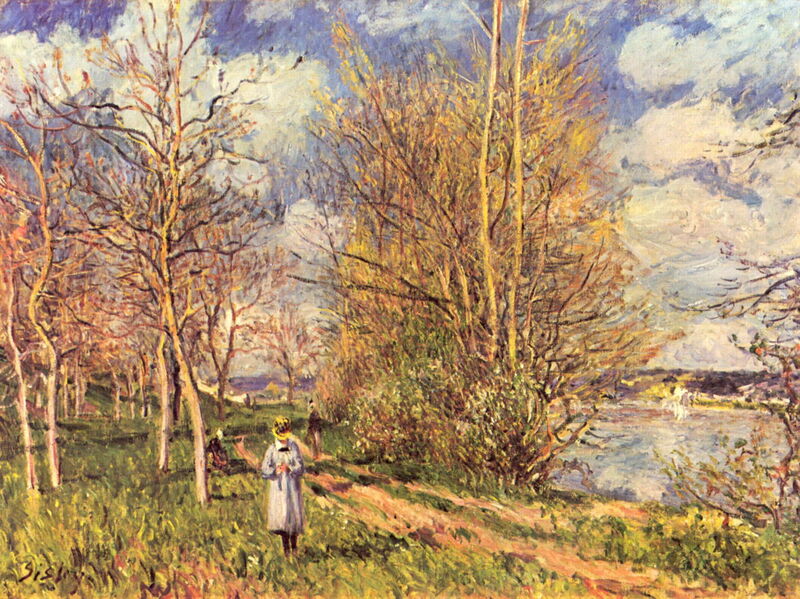 A few of Sisley’s paintings of this period are more experimental. 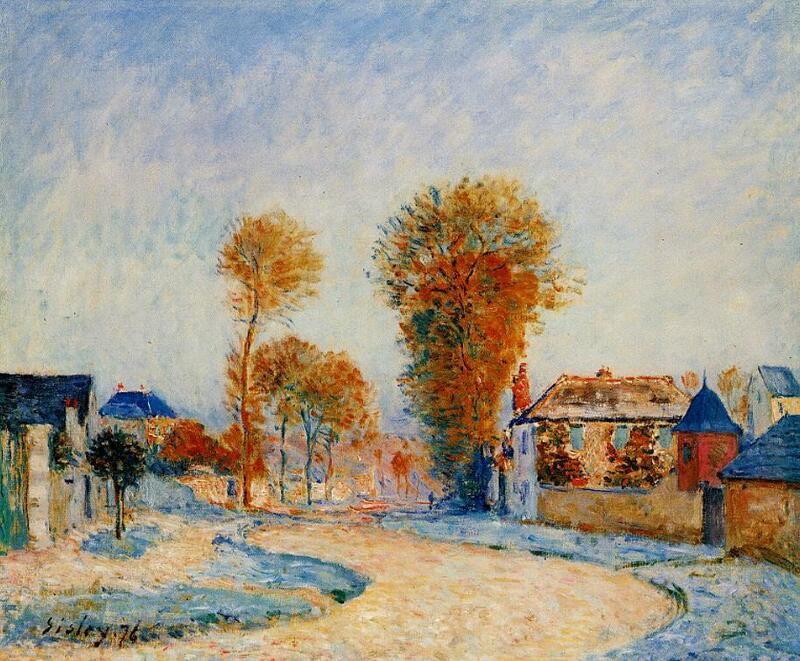 The First Hoarfrost (1876), for instance, with its bright colours and high chroma, might appear more typical of later works by Pissarro (and I did check to see if this painting had been misattributed). However by the late 1870s his paintings settle for a more stable and mature style. Alfred Sisley (1839–1899), Rest along the Stream. Edge of the Wood (1878), oil on canvas, 73 x 80 cm, Musée d’Orsay, Paris. EHN & DIJ Oakley. Rest along the Stream, Edge of the Wood (1878) must be one of Sisley’s finest paintings, and one of the great landscapes of the century. It features multiple stands of trees, each of a different species, and each depicted with remarkable skill. The line of birch trees in the foreground is detailed anatomically, with most branches shown reaching out into the canopy. Trunks are delicately coloured, textured, and shown with dappled shadows. Their foliage consists of carefully graded brushstrokes to give detail of their individual leaves, gradually merging in the distance. On the opposite bank five pollards are flush with fresh growth, and behind them the sunlight brings out the high canopies of more distant trees. To the right (and in front) of the cottage are lower trees with near-white lush foliage. Behind them all stands a high wood, great branches and leaves lit by the sun. The lines of the trees, stream, and the gash of sky all lead the eye to the distant bridge, and the figure of a woman, her back against the foot of one of the birches in the foreground. Alfred Sisley (1839–1899), Walnut Tree in a Thomery Field (1880), oil on canvas, 57 x 71 cm, Private collection. WikiArt. Alfred Sisley (1839–1899), Small Meadows in Spring – By (c 1881), oil on canvas, 54 x 73 cm, Tate Britain, London. Wikimedia Commons. Painted in the early spring of 1881 near the village of By, “Small Meadows in Spring – By” shows younger trees, their branches just starting to show the first leaves as they emerge from bud. The paint surface is similarly textured in fine strokes of contrasting colours. 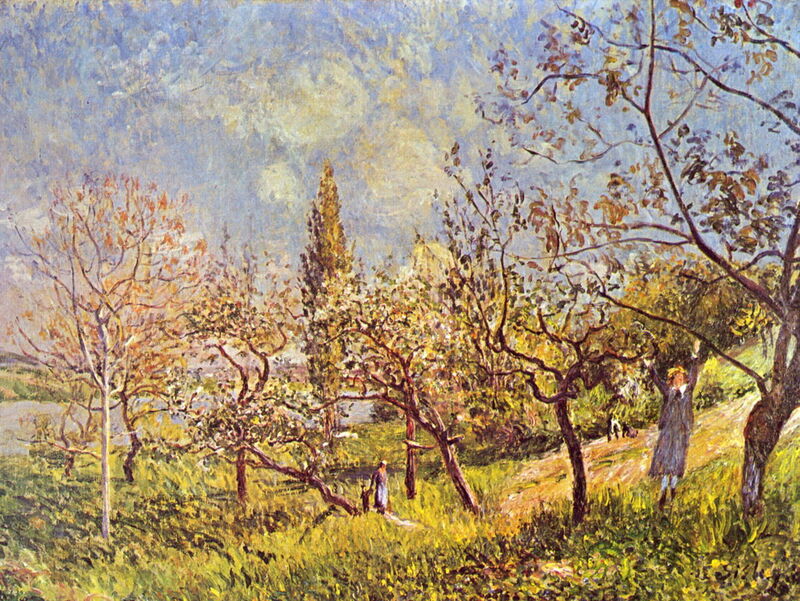 Alfred Sisley (1839–1899), Orchard in Spring – By (1881), oil on canvas, 54 × 72 cm, Museum Boijmans Van Beuningen, Rotterdam. Wikimedia Commons. Slightly later in the same spring, near the same village, the emergence of leaves is further advanced, and depicted in a similar style. Although some of the marks used for vegetation, in the grass, for example, are orientated, there seems little tendency for the swirls and whorls seen in Vincent van Gogh’s landscapes. Alfred Sisley (1839–1899), Windy Day at Véneux (1882), The Hermitage, Saint Petersburg. Wikimedia Commons. Many landscape painters make an attempt to show the effects of wind in trees, but to me this is one of the more successful efforts at what turns out to be a very tricky task. Sisley’s trees here incorporate the wide range of types of mark more typical of Corot. The paint elsewhere has been applied in quite thick daubs, everywhere supporting the horizontal movement driven by the wind. Alfred Sisley (1839–1899), Willows on the Banks of the Orvanne (1883), oil on canvas, 50 x 70 cm, Private collection. Wikimedia Commons. 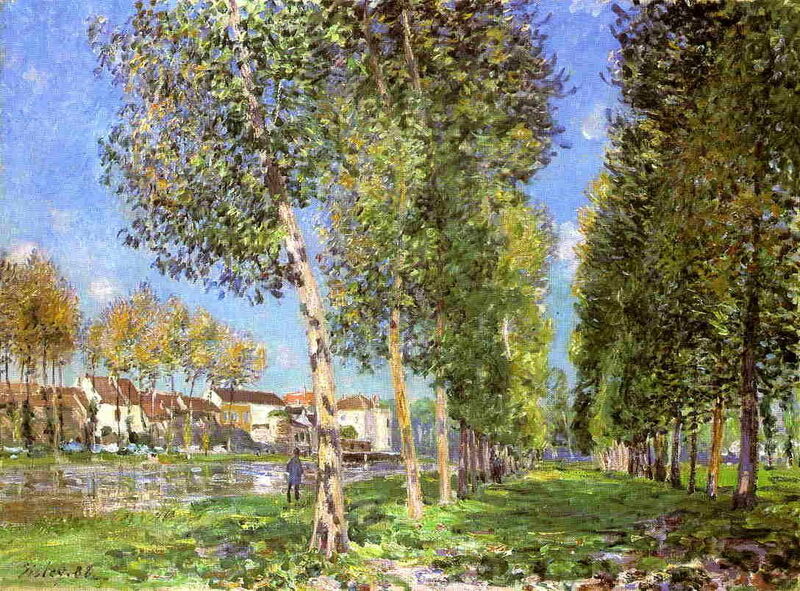 Willows on the Banks of the Orvanne (1883) is another challenging motif which Sisley paints convincingly. An irregular row of pollarded willows, with well-developed heads, crosses the foreground, behind which there is the river Orvanne, reeds, and a tall stand of poplars. Behind this dense grillage is a fence, field, and distant buildings, at the midpoint of the painting. The colours used actually reverse the transition normally seen in aerial perspective, and despite the dense branches, the painting maintains those planes and does not dissolve into confusion. Alfred Sisley (1839–1899), A Corner of the Wood at Sablons, or The Road to the Edge of the Wood (1883), oil on canvas, 60.5 x 73.5 cm, Musée d’Orsay, Paris. Wikimedia Commons. Rich in autumnal reds, A Corner of the Wood at Sablons (1883) is a simpler motif which is dominated by the framing and leading trees. These are again shown in Sisley’s mature style. Alfred Sisley (1839–1899), Moret – The Banks of the River Loing (1885), oil on canvas, 52 × 74 cm, Albertina, Vienna. Wikimedia Commons. Another autumnal view, but here from a couple of years later, Moret – The Banks of the River Loing (1885) uses slightly coarser marks and strong colour contrasts. These bring the foreground even closer, and push the background very deep. 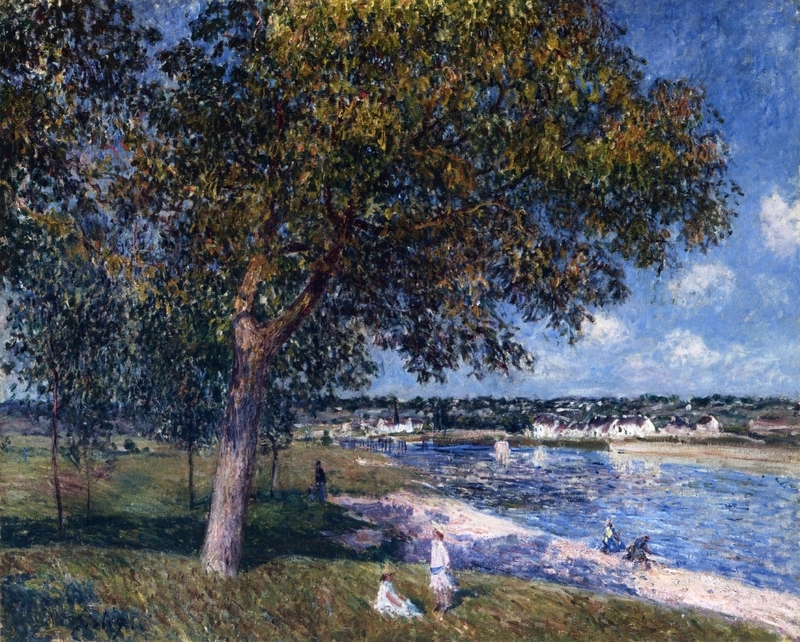 Towards the end of his career, Sisley painted increasingly formal series, in the area around Moret-sur-Loing. 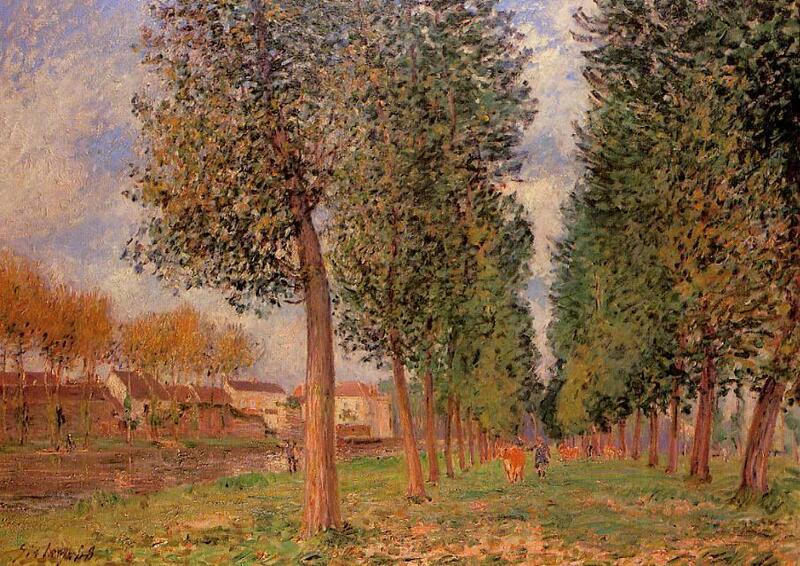 With so many of his paintings dispersed in private collections, and without the help of a modern catalogue raisonné, it is very hard to know how many similar paintings he made of the poplar avenue at Moret, but I can find five which are available in freely-usable images. Recent books on Sisley make only passing mention of this series, placing their emphasis on the loose series of the bridge and town of Moret, and the most famous of Sisley’s series, of the church there. Alfred Sisley (1839–1899), The Lane of Poplars at Moret-sur-Loing (1888), oil on canvas, 60 x 81 cm, Private collection. WikiArt. 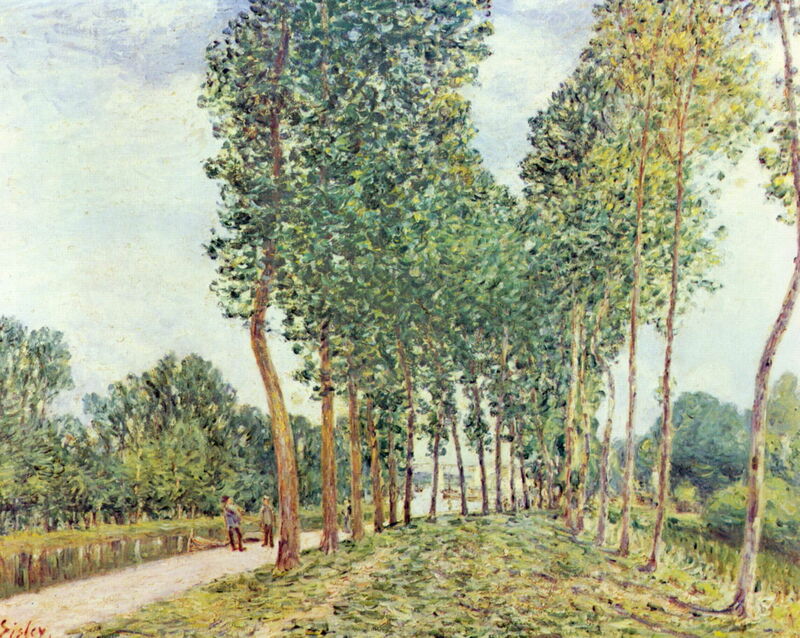 Sisley seems to have started this series, showing the avenue of poplars at Moret-sur-Loing, in 1888, with the first two, shown above and below. They show views from and of almost identical locations, and are painted in very similar style, their differences being attributable to the transient effects of light. However there are more subtle differences in the trees, particularly in the depiction of their bark. Alfred Sisley (1839–1899), Alley of Poplars, Moret-sur-Loing – Cloudy Morning (1888), oil on canvas, 60 x 73 cm, Private collection. Wikimedia Commons. 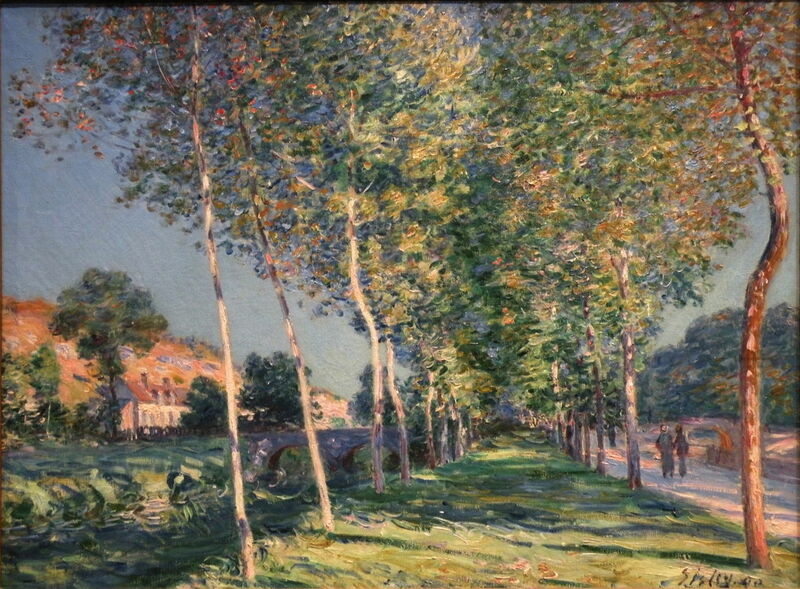 Two years later, Sisley painted another view of the same avenue, but from a quite different point, as shown by the bridge and different trees on the left. Several of the poplars also appear much younger here. Alfred Sisley (1839–1899), The Banks of the Loing at Moret (1892), oil on canvas, 73 x 92 cm, Private collection. WikiArt. After another gap of two years, he painted a near-identical pair of paintings from a third location, shown above and below. These show a higher bridge further in the distance, a bend in the avenue leading to some buildings in the distance. His marks on the trunks and in the foliage are more gestural. Alfred Sisley (1839–1899), The Lane of Poplars on the Banks of the Loing (1892), oil on canvas, 73 x 92 cm, Private collection. WikiArt. 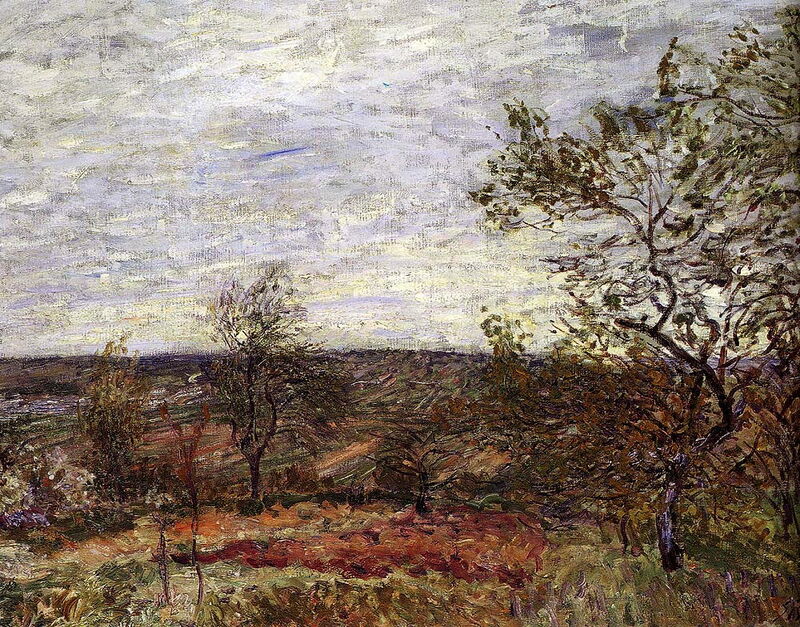 In the same year he painted this barren winter landscape, with its pale grillage of poplars. This was by no means his last painting of trees: when he was in Wales in 1897 he continued to include them in some of the landscapes which he painted there. 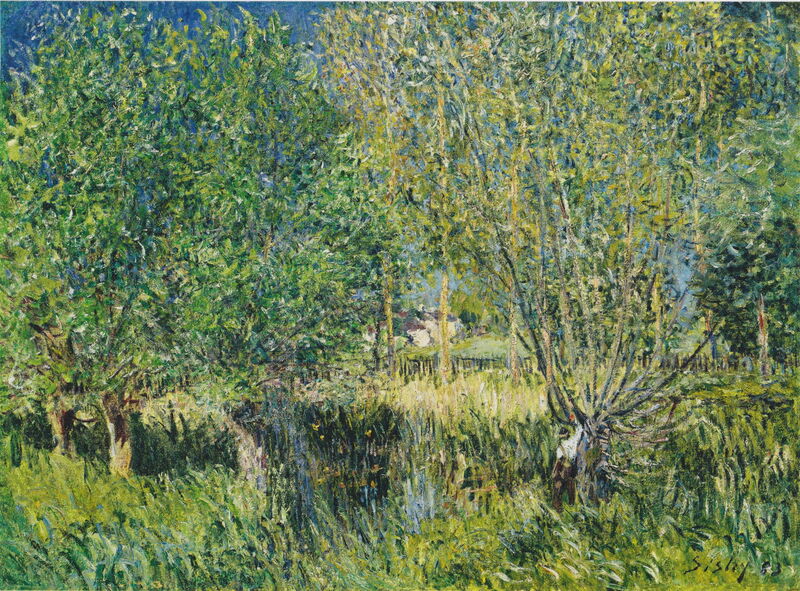 Although Sisley’s most frequent views were of rivers, throughout his career he painted many fine depictions of trees which compare favourably with those of Pissarro and Monet. These were influenced by other Impressionists and by Corot, but were rendered in his own distinctive style. This extended to a series of at least five paintings of a poplar avenue near Moret-sur-Loing, from three different viewpoints. Sisley was a first rate Impressionist, one of the leading landscape painters of the nineteenth century, and we are in urgent need of a new catalogue raisonné and exhibitions featuring his work. Shone R (1992, revisions 2008) Sisley, Phaidon. ISBN 978 0 7148 3892 2. Stevens MA (1992) Alfred Sisley, Yale UP. ISBN 0 300 05244 8. Posted in General, Painting and tagged Barbizon, Corot, landscape, Monet, painting, Pissarro, plein air, series, Sisley, trees. Bookmark the permalink.